Looking to purchase something from a Vancouver area store like IKEA or Structube? 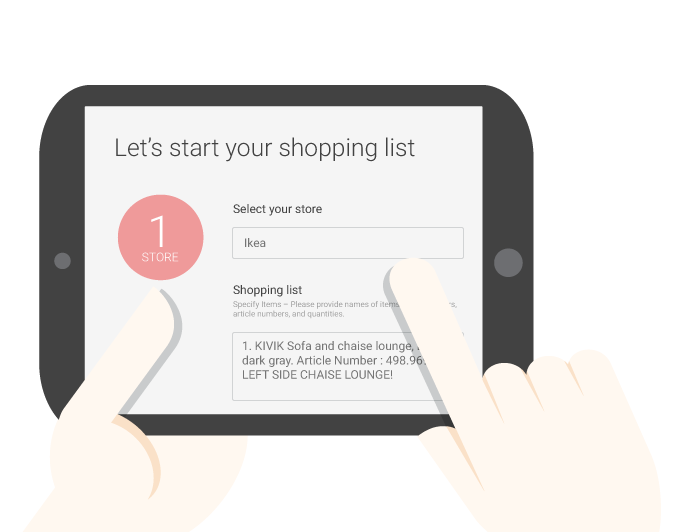 Simply create a shopping list, using our order form. Once we receive your list, we’ll quickly reply with a no obligation quote for your review, along with an expected date of delivery or our upcoming pick-up times, instructions on how to proceed, and our payment options. We require your confirmation to proceed and we’ll then purchase your items. Have a purchase you need collected from a Vancouver area store like West Elm or CB2? Using our order form, let us know what you’ve ordered or would like to order. Once we receive your item details, we’ll quickly reply with a no obligation quote for your review, along with instructions on how to proceed and our payment options. We require your confirmation to proceed and we’ll then schedule your purchase pick-up. Our service fees are calculated based on the package dimensions, weight, value, effort required, and care needed for each order. Our typical IKEA orders of average sized flat packed items (usually over $150) typically qualify for a $35 flat fee plus 10% of the purchase total. Larger and heavier items (sofas, mattresses, etc.) are quoted after we consider measurements and weight. For smaller orders (usually under $100) we will quote based on the type and quantity of items ordered. We do have a $10 minimum service fee to cover our administration costs etc. and our fee will typically range from $10-$39. For purchase pick-ups from shops like EQ3, Once A Tree Furniture, or other popular shops, our minimum collection fee is $39. We can pick up smaller packages, household items and furnishings that are flat packed for assembly for a very reasonable fee. Assembled and quality packed furniture items are assessed individually before we provide a quoted after taking into consideration the measurements, weight and care required for each item. – Many thanks Kim and Chris, M.G. Our company is registered and we can provide your home or office with an invoice, business and GST registration. We also offer a hassle free returns service at no extra charge.